THIS APPLICATION IS FOR HANDMADE VENDORS ONLY! If you are a food truck or Lil Maker, please visit our website and apply for the Spring Swing via the applications for you there: www.thestrawberryswing.com/vendor-opportunities . Thank you! OUTDOOR BOOTHS are 10 ft by 10 ft. Tents are required. The Swing has a few tents available to rent at $25.00/day. There is no electricity provided outdoors. Outdoor booth fees are $225.00 and entire booth fee must be paid by Friday, March 1 if you are chosen to participate. INDOOR BOOTHS vary in size due to the architechture of the barn, but fit at least two 6ft x 2.5ft display tables. There are electrical outlets inside the barn. Indoor booth fees are $275.00 and entire booth fee must be paid by Friday, March 2nd if you are chosen to participate. - Please have both vendors apply seperately and note in the Additional Comments section who you are sharing with. Each will have their own applicaiton/application fee. Please complete this application fully and make sure you add a photo of your booth set up, along with your products. Applications close Friday, February 15th at 11:59 pm. The jury will deliberate and vendor notices will go out via email Friday, February 22nd before 11:59 pm. Booth fees will be due in their entirety by Friday, March 1st. This event is juried. We, along with our trusted jury, will review each application and take a variety of items into consideration when choosing our vendors. We are looking for quality handmade items, a cohesive brand, great photographs of your items so we can see what you make, innovative items, etc. Application fees cover this jurying process and are NON-REFUNDABLE. Thank you for being so wildly creative! 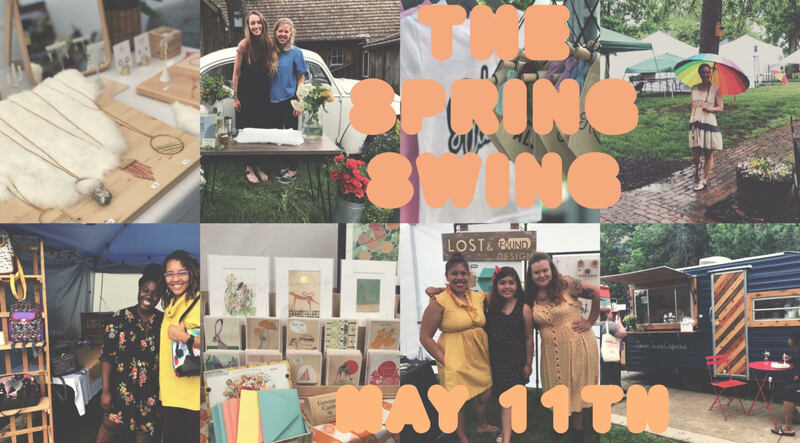 We can't wait to see what you have in store for us at our 5th Annual Spring Swing! Have you participated in one of the past Swing events? Make sure the link works; don't forget the http:// and the .com! Indoor vendor applicants: if indoor is unavailable will you accept outdoor instead? After submitting below you will be redirected to Paypal to complete your application. The Jury will discuss and notify vendors of their status on Friday, February 22nd by 11:59 pm Your application fee is non-refundable. Thank you for making the handmade movement in Kansas City so amazing!